Screw-retained, full contour CAD/CAM, Zirconia crown. *AVOID CLINICAL CHALLENGES / IMPLANT FAILURE LINKED TO CEMENT RETAINED RESTORATIONS! See comprehensive clinical report here. For fees please request our comprehensive catalog here: CATALOG REQUEST! ZirONE-Ti FCZ™ Solid Zirconia is a monolithic zirconia crown, bridge, screw-retained implant crown, inlay or onlay with no porcelain overlay. First launched as being “More Brawn Than Beauty,” the material was originally intended to provide a durable, more esthetic alternative to posterior metal occlusal PFMs or cast gold restorations for demanding situations like bruxers, implant restorations and areas with limited occlusal space. Now, thanks to advanced techniques Zir-ONE™ restorations exhibit improved translucency and color similar to natural dentition, making them a restorative option in the anterior as well. Complete color penetration all the way through the restorations ensures greater shade consistency and prevents any shade changes after occlusal adjustment. Designed and milled using CAD/CAM technology, Zir-ONE™ Solid Zirconia is sintered for 2.0 hours at 1,530 degrees Celsius to achieve optimum strength. The final crown or bridge is then glazed to a smooth surface. *Although highly accepted and widely utilized Ti base (Zirconia Abutment with a Titanium sleeve) abutments are NOT a brand authentic component. If ABUTMENT failure occurs we will replace the abutment & crown free of charge. We believe IMPLANT failure is typically due to Biologic challenges causing poor osseointegration and NOT linked to the abutment component. Therefore we do not warranty the implant. To maintain Implant System warranties we recommend our Gardali ImplantONE-AUTHENTIC™ components. Zir-ONE-Ti™ is indicated for crowns, bridges, implants, inlays and onlays. It is an esthetic alternative to PFM metal occlusal/lingual or full-cast restorations. The chip proof durability of a Zir-ONE™ restoration is ideal for bruxers who have broken natural teeth or previous PFM restorations. Zir-ONE™ is also ideal when the patient lacks the preparation space for a PFM. Adjust Zir-ONE™ restorations using a fine-grit diamond with light pressure to avoid potential microfractures. A football-shaped bur is most effective for adjusting the occlusal surfaces of posterior teeth and lingual surfaces of anterior teeth. Zir-ONE™ restorations are fabricated from solid zirconia oxide material, much like the zirconia oxide coping found in restorations such as Prismatik Clinical Zirconia™, Lava™ Zirconia (3M ESPE; St. Paul, Minn.), and NobelProcera™ (Nobel Biocare; Yorba Linda, Calif.). Like most metals, zirconia exhibits a strong affinity for phosphate groups, and zirconia oxide is no different. We can take advantage of this fact with phosphate-containing primers, such as Monobond Plus (Ivoclar Vivadent; Amherst, N.Y.) and Z-Prime™ Plus (Bisco; Schaumburg, Ill.), or cements such as Ceramir® Crown & Bridge (Doxa Dental; Newport Beach, Calif.). Unfortunately, saliva also contains phosphates in the form of phospholipids, so when a Zir-ONE™ crown or bridge is tried in the patient’s mouth and comes in contact with saliva, the phosphate groups in the saliva bind to the zirconia oxide and cannot be rinsed out with water. Attempting to use phosphoric acid (which is full of phosphate groups) to “clean” the saliva out only makes the problem worse. The only way we have found to successfully remove these phosphate groups from the interior of a Zir-ONE™ restoration is with the use of Ivoclean (Ivoclar Vivadent). This is a zirconia oxide solution placed inside the restoration for 20 seconds and then rinsed out. Due to the large concentration of free zirconia oxide in the Ivoclean, it acts as a sponge and binds to the phosphate groups that were previously bound to the Zir-ONE™ restoration. Once the Ivoclean is rinsed out, you will have a fresh bonding surface for the Monobond Plus, Z-Prime Plus or Ceramir to bond to. Try in Zir-ONE™ or zirconia-based restoration. Rinse saliva out of restoration. Place Ivoclean in restoration for 20 seconds and rinse. 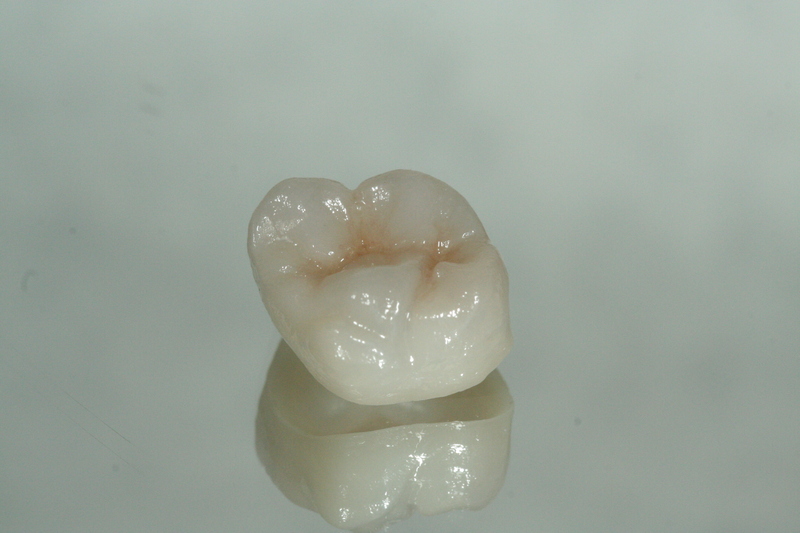 Cement restoration with Ceramir –or– place Monobond Plus/Z-Prime Plus and place with cement of your choice. Ready to send a case? Click here for supplies! Need our comprehensive catalog of restorations? Click here for our catalog!